ModIII pitch shifter modules are multiplying the frequencies of a signal by the same factor. The signal’s pitch will be transposed and harmonic relationships will be preserved. Artefacts can be heard though and some delay has to be put up with (up to 30ms). The Speed control sets how quick and exact the module works. Basically a pitch shifter with integrated mono tempo delay. Nice Fx if you let the pitch rise or fall as the delay fades out. mp3: freqOut>sineOSC, rude tweaking of all parameters. ModIV pitch shifter modules: FLL and PLL Tuner. Connect Modular MIDI in to MIDI in of this module and you can "play" the PitchShifter, using a keyboard. 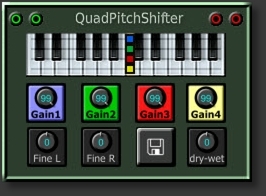 Four Stereo Pitch Shifter in one module. Easy Pitch select by virtual keyboard.